How do you prove ownership and the fact that you have bred a bird? Whilst I must admit that for every method of identifying anywhere there is probably some form of forgery or malpractice that can be resorted to, there would appear to be only one currently available method of identifying individual birds; the fitting of a suitable closed ring at the nestling stage. Chicks when closed rung are lost through their parents deserting or neglecting them after the interference to the nest; this I believe is due to faulty technique in removing and replacing the chicks in the nest. 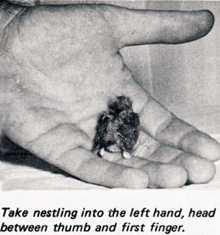 Chicks are sometimes mutilated by themselves or their parents trying to get the ring off; this again I believe is due to faulty technique. Whilst I have not personally experienced this, I have heard of it occurring in both canaries and parrots and I suspect that in the cases with parrots, it was because the chicks were rung after they had fledged. I personally believe that if the closed ring can be put on any bird at this stage, the ring is too big in any case. There is always the danger of a bird incurring leg injury due to the ring becoming caught up or through some foreign object, such as seed or seed husks, lodging between the ring and the leg. This is a contingency which has to be watched for at all times; however whilst I have seen several cases of birds being injured from rings, in every case the ring used has been an incorrectly fitted split plastic ring. My advice to anyone who has to use a split plastic ring to identify a bird is to firstly ensure that the ring is of the correct size and particularly is not too large. Secondly, after fitting the ring, seal the split with a dab of acetone. The first step is to get the chicks out of the nest, and the method of removal of the chick from the nest is most important. The best way is to burrow in through the back of the nest, or alternatively down through the top of the nest. As a last resort, use a long handled plastic spoon carefully through the entrance. I use a plastic spoon because I think a metal spoon is too cold. The type of nest box used or the actual sitting of the nest will dictate the method used. For nest boxes, I prefer press top tins with half the bottom removed for an entrance, so that the press top becomes the back of the nest. When using any metal nest boxes, it is a good idea to punch plenty of ventilation holes in the tin, and also a liner made from corrugated cardboard seems to prevent condensation and also gives a bit of extra thermal insulation. With this type of nest box, it is a simple matter to remove the lid, and even the making of quite a large hole in the back of the nest doesn't seem to worry the parents. AS A GENERAL RULE, DON'T INTERFERE WITH THE MOUTH OR ENTRANCE OF A FINCH NEST as I have found that interference with the nest tunnel would appear to be the most effective way of having the parents desert. Remove all the chicks from the nest and replace them as they are rung. This may seem elementary, but visualise the situation of five or six chicks in a nest; the first two or three are no trouble, but soon you keep fishing out one that has already been rung. Also, with the nest empty, it is a good time to give a light dusting with a suitable insecticide powder and remove any infertile eggs. Keep chicks warm while they are out of the nest and awaiting rings, particularly for the first couple of nests - after that you will gain speed and confidence. Now to put the rings on. 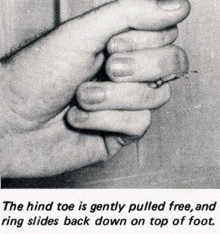 The technique of applying a closed ring will be old hat for canary and budgerigar breeders; however, a brief description may not be amiss for those who have not had a go. The whole object is to put a closed ring on a chick so that when it matures the ring cannot be removed, which means fitting the correct size ring and having the chick at the correct stage of development. Not all finches develop at the same rate, but as a general rule, towards the latter part of the pinfeather stage or when their eyes are just about fully open seems to be the most suitable time for ringing. If rung too soon, you stand a fair chance of them kicking the ring off, and if too late, you stand a chance of injuring them. Also it is probably getting too close to the time when they would be due to fledge. This can lead to early fledging which, of course, should always be avoided. Here is my method of fitting rings. 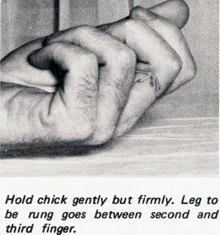 Hold the chick in your left hand, head between thumb and index finger, and its right leg between your second and third finger. 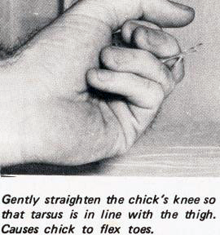 Now gently straighten the chick's knee so that the tarsus is nearly in line with the thigh - this causes the chick to flex its toes - and slide the ring over the front three toes. Here "gently" is the operative word, as you are dealing with a chick's leg which is thinner and softer than a match stick. The ring is now slid over the foot and up the tarsus, the hind toe can be gently pulled free and the ring slides back down to the top of the foot. It is really quite easy and takes far less time than it takes to tell. 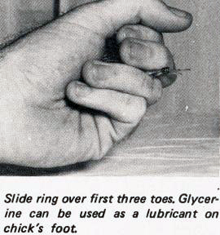 When sliding the ring over the foot, it should be a firm fit, as if it goes on too freely the chances are that the chick will be able to kick the ring off; however, if you feel that the skin of the foot will be broken by forcing the ring on, then by all means use a lubricant on the chick's foot. Glycerine is possibly the best as it can be easily rinsed off the foot with a little warm water and thus avoids having the chick's down and feathers messed, as can easily happen with other oily substances such as petroleum jelly. Now return the chicks through the hole in the back of the nest and replace the lid. With a nest box having a removable back, there does not seem to be any need to repair the hole made in the back of the nest. However, with nests built in ti-tree or shrubbery, it is a good idea to carefully close it by teasing the nesting material back into place. 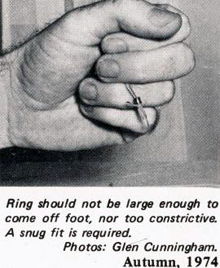 Whilst the above list is not comprehensive, it does give an idea of the sizes of rings to order. It may be noted that the sizes I have recommended are in some cases considerably smaller than those suggested by others. However, I firmly believe that the smallest size that can be comfortably worn by the adult bird is the correct size. Larger rings are more prone to causing leg injury and any ring which can be fitted to an adult bird defeats the purpose of close ringing. If you have any doubt as to the suitability of a ring, measure the leg of an adult bird to ensure that the ring will be of the correct size. Vernier calipers are probably the best but a good pair of dividers and a rule is usually accurate enough. Be careful with the dividers; don't stab the bird (or your fingers). The inside diameter of a ring can be measured to within a few thousandths of an inch with a set of numbered drills: Nos. 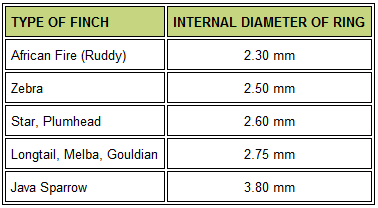 30 to 44 (0.128" to 0.086") should cover any but the very large finch sizes. Some currently available rings are totally unsuitable as delivered. They have a sharp internal lip which must be removed (I used the sharpened tang of a file to de-burr them) before they are used. This de-burring is tedious and hard on the fingers, and it is strongly recommended that only well made rings supplied by a reputable manufacture are used. Another point to note is that the rings supplied by some manufacturers vary appreciably in size depending on the number of digits stamped on them, i.e. of a series, ring Nos. 1-9 are appreciably smaller than 100-999. Autumn may seem the wrong time for this article, but it gives members time to consider, and if they accept the proposition of closed ringing then they have plenty of time to organise for next season, and may wish to have a go with a late nest or two this season.